Fender 500K Split Shaft Potentiometer. 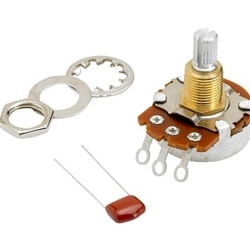 500K potentiometer (usually associated with humbucking pickups) with 3/8" split-shaft design, for use as volume or tone control on nearly all U.S.- and Mexico-made Fender instruments with split-shaft potentiometers. Takes push-on control knob (no set screw). Mounting hardware and .022mf 250V tone capacitor included.